Parapets are the top of the walls on a flat roof house or building which extend above the roof. The parapets are an area where the stucco is exposed to the weather. Repairing holes, cracks and chips on parapets helps prevent moisture damage to interior walls. Maintenance of the "high exposure" areas of the stucco will prolong having to do a complete restucco for many years. At Stucco Solutions we approach parapet repair in many different ways. Depending on what condition your parapets are in and the extent of damage of the parapets will detemine if just repairs need to be done or if a complete parapet rebuild is needed. Many times home owners don't realize that leaks can occur from stucco in disrepair rather than the roof. 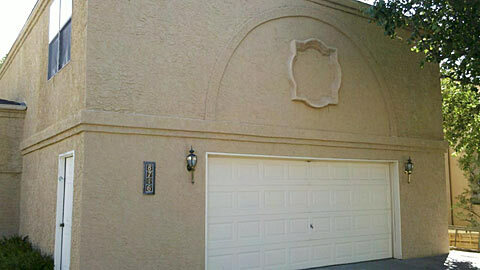 Stucco Solutions can inspect your stucco and repair any damage found. Selling your home/home inspection report? Stucco Solutions can fix any issues found on your home inspection report and will guarantee that the repairs will pass inspection. Color of a repair is one of the biggest concerns. This is a difficult task that takes years to perfect. Over time, natural stucco tends to become darker so when the correct color out of the bag is put on the wall the color will not match the existing stucco. The repair needs to be Fog Koted. This is a process in which the stucco color is tinted to match the existing stucco, then sprayed or fogged over the repairs to achieve color uniformity. This Fog Kote is not paint, it's tinted stucco with the sand removed so it can be sprayed on the wall to restore or blend the color of a repair. Where the cracks are located will determine whether the crack needs to be fixed or not. 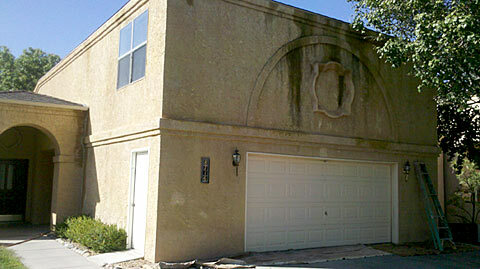 Stucco Solutions can inspect any cracks in your stucco and advise you on whether they need repairs. Flaking stucco is called spalling. Spalling frequently occurs under canales and around chimneys and at the bottom of walls which are frequently exposed to continuous moisture. Cracks at window corners are important to seal up to ensure leaking doesn't occur. Improper diversion of water off of the house can cause water to run down the stucco and discolor it. Stained stucco areas are another situation where Fog Kote can be utilized to restore the color of the stucco areas where water has run down and caused discoloration. Stains can be corrected with the Fog Kote process. Copyright 2011-2016 Stucco Solutions. All rights reserved. Site design by Luckey Graphic Design.